She was beautiful to the eye. Long blonde hair, perfect body, greenest eyes anyone had ever seen and a smile that could eat your soul. Heads turned whenever she walked into a room and she knew it. He had women falling at his feet everywhere he went, he played on that. They knew it, and he knew it but that didn't stop them following him. He played it with no strings, getting what he wanted and saying goodbye. It was easier that way, knowing he would never be in the same city for too long. It was hard to keep a relationship and he liked it that way. His life ran in a way that made it perfect for him. Until he met her. Until she twisted her way into his life, and changed it. Sequel to "Beautiful Lie" and 2nd part of the Beautiful Lie series. Nick Carter. 31, and in love with two woman, and a father of one. Now he's engaged to one woman, can he resist the urge to be with his first true love? Or does he live happily ever after with his other love? 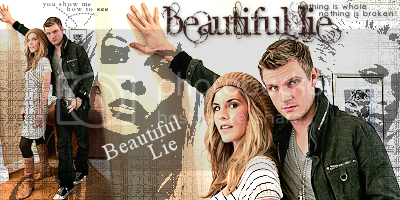 Third Instalment of the "Beautiful Lie Series"
One month has passed and a lot has changed for Nick, Paige and Lindsay. But there's one question on all of their lips. Fourth Story in the "Beautiful Lie" Series. A year has past, and with a solo album ready to be released and two kids to look after, Nick realises he's ready to open a new chapter in his life.